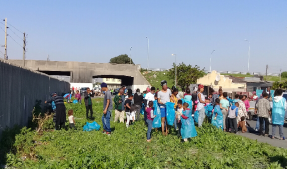 Residents of the Stutterheim-based, Amahlathi Municipality, in the Eastern Cape led by a multi-stakeholder forum have embarked on a cleanup campaign. Residents say rubbish has not been collected for five months following a violent service delivery protest. The protest was led by youths who accused their councillors of nepotism, corruption and maladministration. One person died in hospital after he was allegedly shot by police and five municipal buildings including a clinic were torched. “It’s a community led programme where all people will volunteer to engage and embark on the cleaning of Amahlathi. The programme will start at Mlungisi and Xholorha and then we will be joining spiritual leaders from different faith communities to basically lead a prayer – a prayer for stability, a prayer for peace, a prayer for prosperity; and we’re expecting the Mayor to make a note basically calling on all the people of Amahlati to refocus their energies and rebuilding the future of Amahlathi local municipality,” says Siyabulela Makunga, multi-stakeholder forum convener. The post Amahlathi residents embark on cleanup campaign appeared first on SABC News – Breaking news, special reports, world, business, sport coverage of all South African current events. Africa's news leader..